Another month, another twist out of nowhere. 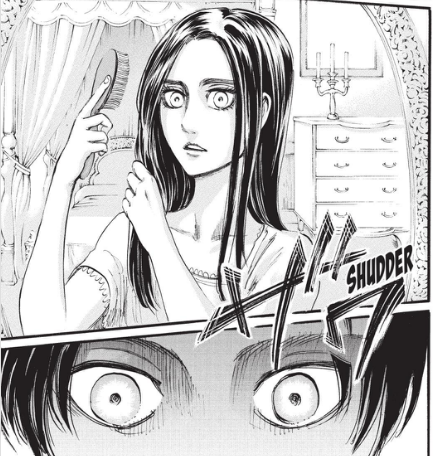 To start with, Eren apparently doesn't have the same skin hardening ability that Annie has. What we do get is concrete proof that there's something of a time limit when it comes to how often a Titan shifter can transform and how long they can do so without losing themselves. 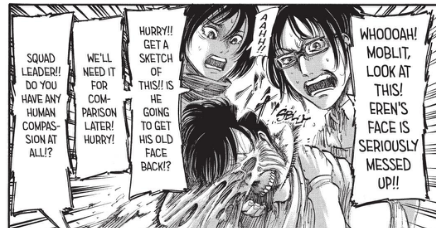 Eren's face completely fusing with his Titan form is particularly interesting in light of Ymir's comments about spending a lot of time as a mindless Titan as well as Hanji's statement from Chapter 51 that she's never found anything human inside the Titans. 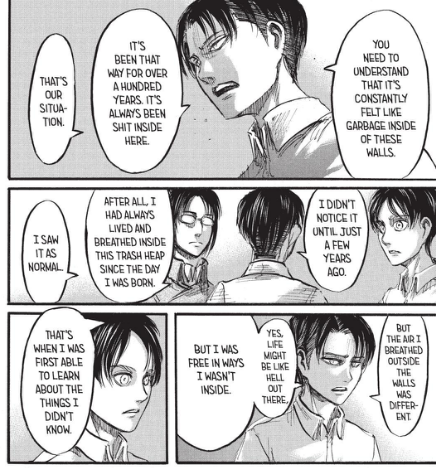 However, we still don't know what exactly Eren can and can't do. Hopefully the whole Titan mind control thing (or whatever it was) comes back up again, since none of the characters have mentioned it since it happened. All of that is more than enough to chew over for now if you ask me, but since the manga has gone the conspiracy route, this chapter made it clear that this arc will be dealing with the Wall Cult and the Reiss family. 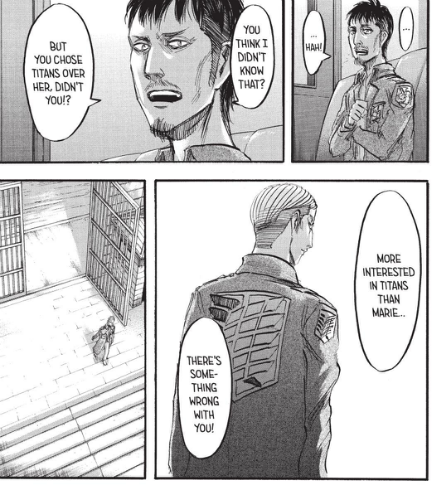 Erwin is also trying to get to the bottom of things in his own way. Are we finally going to learn about the royal family in the next chapter? Outside of the military, we haven't gotten much explanation on how government works in the world so far. 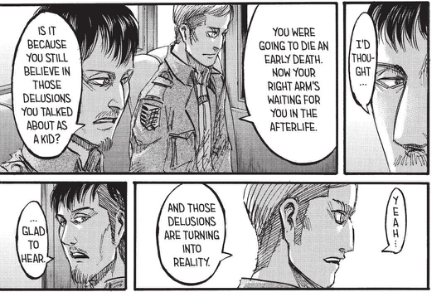 Anyway, I really enjoyed the conversation between Nile and Erwin here. I mentioned this in an earlier post, but Erwin is a character who's been completely defined by his station. We know very little about him outside of his position as commander and that he's willing to do almost anything if it means a victory with minimal loss of life. With this, now we have an idea of how far he's gone and how much he's given up. He obviously still considers Nile a friend, or enough of one that he's willing to drop sensitive information about the Military Police participating in the cover-up without much of a second thought. Does it have to do with the "delusions" Nile mentioned? I have to admit I'm a little concerned for Erwin. Whenever this series starts to humanize a character who got little attention in that department beforehand usually means that they're about to die. 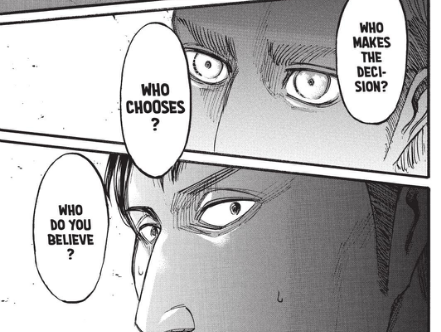 I really hope that I'm wrong on this, since the more recent chapters alongside the stuff from the Choice With No Regrets spinoff are turning him into a fascinating character. However, it does feel like he's painting a target on his back by going to the king. There's crossdressing Armin in this chapter, they said. Isayama is listening to the fans, they said. In the meantime, Levi and the kids are trying a dangerous gamble to flush out whoever's been watching them. 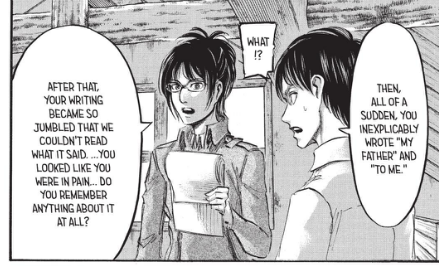 It's been a running joke in the fanbase for a while that Armin looks almost exactly like Historia, but I never thought that it would come up in the actual series. The only thing counterbalancing my general revulsion at the scene above is the fact that Jean kept his Eren cosplay. Where is the Scouting Legion getting these wigs? Actually, I have a better question. What the heck is going on in this series? I love to speculate, but this has gone on for long enough. There were already a ton of unanswered questions floating around, and this chapter only added to them. In my post on the previous chapter, I was frustrated at the end because I felt like the story had cheated its way out of revealing the truth behind the Reiss family, which it's been teasing for a while now. I don't mind being kept in the dark for the sake of a mystery, but that's only when the writing convinces me that it knows what it's doing. For the last couple chapters, it feels like the current plotline is being made up as we go along. 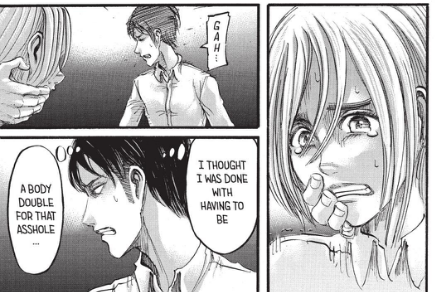 And with Isayama stating in an interview that he's considering changing the ending, I wonder if that's where that feeling is coming from. If we don't get some concrete answers to at least a couple of the big questions soon, the series may just collapse on itself from how convoluted it's become. At the moment, the main reason I'm still so heavily invested is because of the characters. 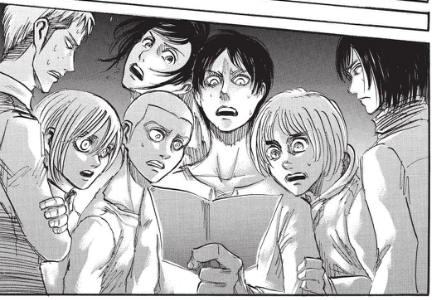 Each of them has stolen my heart, and I want to see them figure all this stuff out and save humanity, or whatever the new ending Isayama is planning has in store for them. However, it is incredibly frustrating to not know what they're risking themselves for in the current arc. 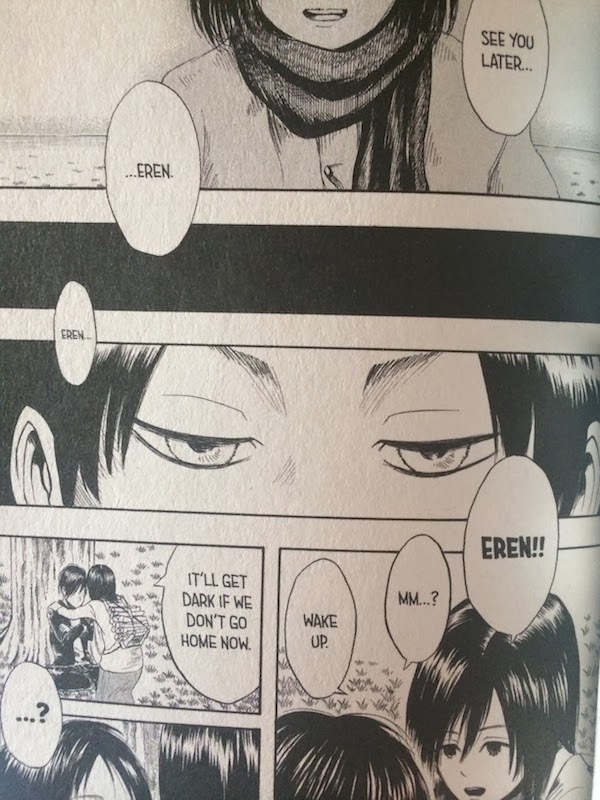 For example, Erwin sends them a letter which is apparently pretty shocking (see top image), yet the chapter decides to not tell us what's in it. Why? What's the point in keeping the readers in the dark on something that the characters are aware of? But even with all of that said, this series has demonstrated some of the most subtle foreshadowing I've ever seen in the past, so it's also possible that the key is right in front of us but we're just not aware of it. At least, I hope that's the case. I want to believe that there is a point to all of this. So. What's next month's twist going to be? The king is a Titan? Marco is back from the dead? If we get at least a few answers, I don't care what happens as long as no one dies. 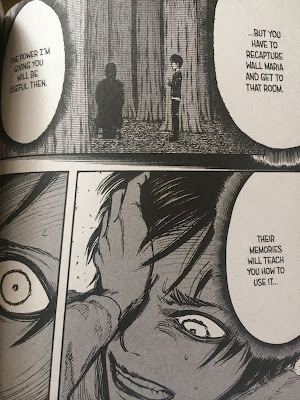 I just think Isayama has no idea how to untangle the plot threads he created, and is trying to buy time for himself. That said, I think you'll like this Titan 4-panel manga collection. They were placed on the official anime website, but were taken down every week. Someone took them and compiled them into English for our enjoyment. If you are watching Nobunaga the Fool, how do you find it? It's interesting, although knowledge of Japanese historical figures is crucial towards understanding certain Eastern Star characters.(ie. why Hideyoshi is called Monkey) The same goes for Tarot card meanings and how they tie in with each episode. It definitely feels that way. I'm still hoping that things clear up soon.